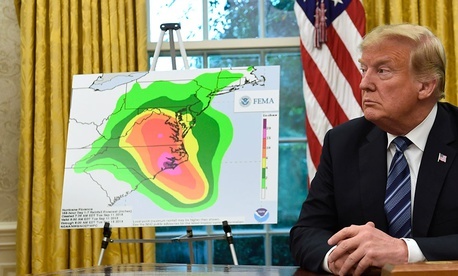 “We’re as ready as anybody has ever been” for Hurricane Florence, President Donald Trump said from the White House on Tuesday, speaking about the Category 4 hurricane that’s barreling toward the US’s southeastern shore. Federal officials are worried about long-term power outages, and about people running out of groceries and fuel for days after the storm. They’re also concerned that major infrastructure including roads, bridges, waterways, power plants, and government buildings could be destroyed. The flooding damage could stretch far inland, into Georgia and to Ohio, Pennsylvania, and Tennessee, they said, predicting that already saturated land will be inundated with another 12 to 24 inches of water in some spots. “This is not a storm that on day three the roads will be back, the trees will be green, and the power will be on,” said Jeff Byard, associate administrator for the office of response and recovery at the Federal Emergency Management Association. While Byard and other government officials say they’re prepared for the storm, some Trump White House policies have led to vacancies at key agencies, and to industry rules that could make it harder to contain contamination during flooding. Despite a brutal hurricane season last year, including thousands of deaths in Puerto Rico after Hurricane Maria, FEMA still has vacancies at the top. There’s no permanent deputy administrator, the agency’s number two position, according to an August 2018 organization chart, nor a permanent official in charge of “mission support,” “human capital,” or security. The federal government is the nation’s largest employer, and under Trump has become so badly managed that some federal employee veterans refer to it as unprecedentedly toxic. Jobs have remained open in some cases because the White House agency tasked with approving top hires conducted Trump “purity tests,” refusing to sign off on anyone who had ever criticized Trump before the 2016 election, including on their own personal social media accounts, other federal employees say. “We always welcome a deputy,” Byard said, but FEMA already has teams working around the country after other disasters. “We’re covered in a lot of the area where we need to be,” he said. While FEMA is “definitely looking at staffing,” it has state and local partners it is working with as well. FEMA and its parent agency, the Department of Homeland Security, have no funding after Oct. 1, because the Congress has yet to pass a spending resolution for the DHS’s more than $50 billion annual budget, despite passing bills for most other agencies. That’s because Trump continues to threaten to shut down the government unless the DHS budget contains money for his U.S.-Mexico border wall, a fight that Republicans in Congress believe would make the party look bad ahead of the midterm elections. Congress is expected to pass a “continuing resolution” to keep the DHS funded until after November, but the uncertainty about how much money different parts of the department will get makes long-term planning more difficult. Hardline anti-immigration think tanks with influence in the White House are also lobbying against the proposed spending bill. The Environmental Protection Agency plays a crucial role in cleaning up contaminated water, mitigating chemical and other spills after a storm. But Trump’s all-out war on the agency that he promised to destroy while he was on the campaign trail has decimated its ranks to levels not seen since the Reagan administration, as the Washington Post reports, with a net 1,200 fewer workers in the past 18 months. Empty positions include the top emergency planning and community coordinator for the EPA’s Region 3, which includes Virginia, Maryland, and Pennsylvania. An EPA spokesman said that that agency’s budget for response and recovery programs had actually increased slightly from 2016, and that it was “conducting the necessary response planning to support any requests from response partners that are related to potential discharge and/or releases of oil or hazardous materials,” but he did not answer several questions about staffing levels. The Trump administration has rolled back rules that related to chemical manufacturers, power plants, and others in industry, which could make it harder to identify toxic spills, environment experts say. The repeals include part of the Clean Water Act that forced companies to take extra care near drinking water supplies. Last August, Trump rescinded an Obama-era executive order that required federal contractors take into account the “best-available and actionable science” on sea-level rise when building federal infrastructure, like raising federal highways by two feet from top projected water levels.